You can discover all that Bali has to offer with Nusa Dua Retreat Boutique Villa Resort & Spa as a base. Nusa Dua Retreat & Spa has 41 spacious Luxury villas, each with its own swimming pool, private courtyard and open-air pavilion (except in Deluxe Pool Villa). Here the harmonious blend of Balinese traditional architecture, interpreted in international style and elegance, promises you uncompromised luxury, privacy and every convenience. Views from the Nusa Dua Retreat are nothing less than picture-perfect. Re-discover the joy of pure relaxation in unparalleled comfort and space in each of our exquisitely designed Bali luxury villas. Surrender yourself to the enchantment of Bali's beauty and serenity in the luxury of flawless perfection to be found in our luxury villas. 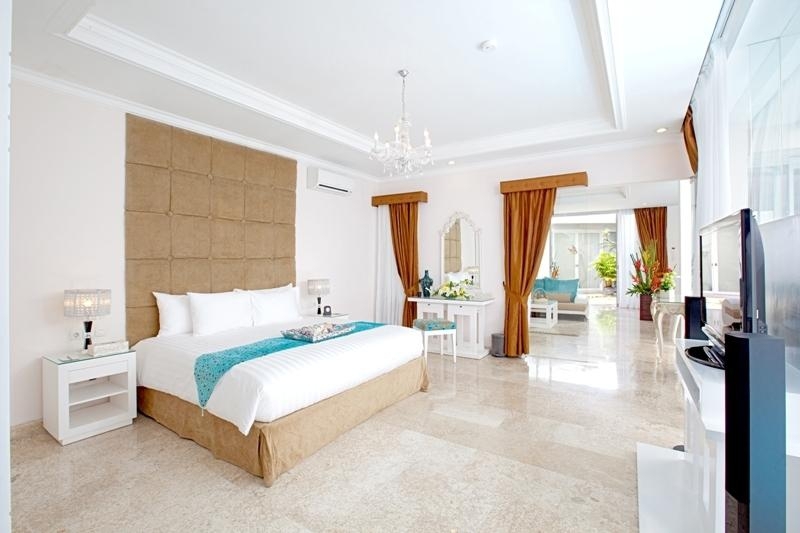 Choose from Pool Villa, Deluxe Pool Villa, or Grand Deluxe Pool Villa. Enjoy our Viaso Lounge and Restaurant, noted for genuine Indonesian and International Foods. The breakfast offers a selection of a la-carte Asian and Western cuisines. Chef's specially designed international a la-carte menu for dinner is a combination of traditional flavours and contemporary presentation. We are also well known for an impressive collection of organic, healthy beverages. The patio is exclusively for hotel guests, offering an unmatched view of Bali's harmonious lifestyle while sipping your Brandy and coffee. Share the warm tropical breeze of the sea and panoramic views of the Indian Ocean at Pure Bar. Pure Bar offers a wide variety of exotic drinks to quench your thirst, plus Asian Tapas to delight your taste buds. There is no better place to relax and watch the world go by.